Brad Withrow-Robinson, Forestry & Natural Resources Extension agent for Benton, Linn and Polk Counties. 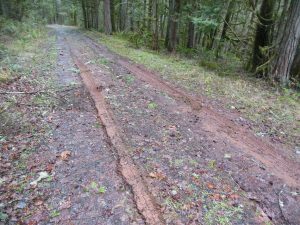 In a previous post , I wrote about the value of roads for a woodland owner, as well as the responsibly to maintain roads to protect their value as well as our water resources. 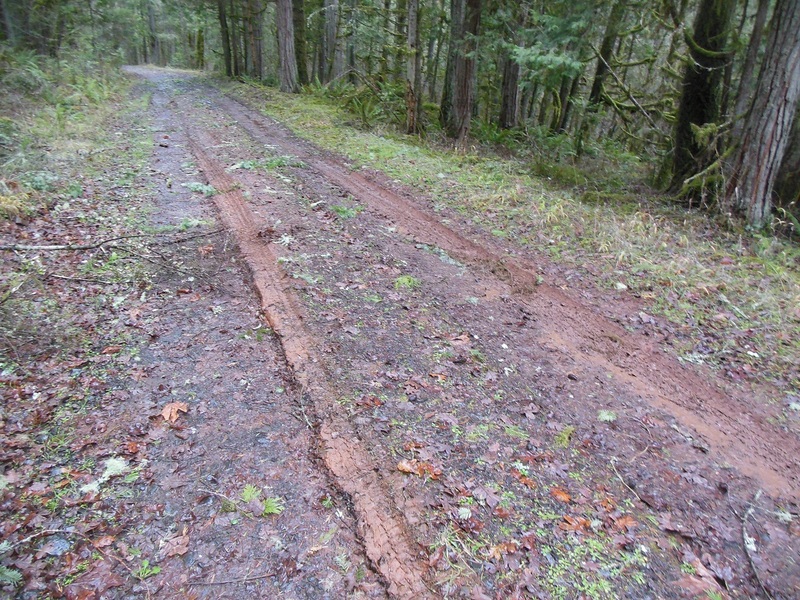 Many family forest landowners have older, “legacy” roads. These older roads were likely not built to today’s engineering standards, have lost some of their function over time, so are deserving of some attention and stewardship. So what does that involve? It likely begins with observation. Make it a habit to get out and inspect your road system regularly. Since water is a key element and force causing damage to roads, get out in the wet season. Bring paper, make notes and keep them as a reminder of what you saw and did. 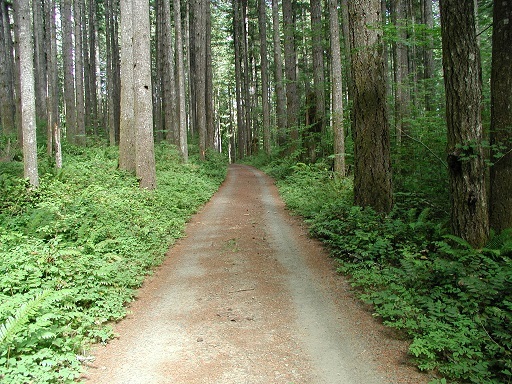 Roads are an important asset for a woodland owner. Roads give access to the woods by foot and or vehicle, for some or all of the year. This allows for recreation, management activities such as planting, weed control or harvest, and also fire protection. Roads are an important piece of a property’s infrastructure along with buildings or ponds, and represent a significant financial investment. I’m starting a new series of posts for those of you, like me, that (for better or worse) are smartphone and tablet users. More often than not these days, there are a few participants in my Extension workshops taking notes on their iPads*. And smartphones…well, with nearly half of all U.S. adults owning a smartphone, they are a fact of life. There’s an app for just about everything, including forestry and natural resources. I thought I’d share some of the apps that I’ve found useful, starting with this post. A caveat – I have an iPhone 4 (sorry Android users) so can’t download some recent app versions only compatible with Androids or iPhone 5, or other devices. 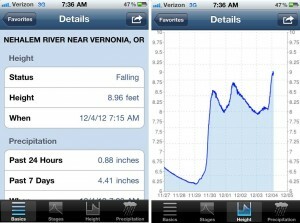 With much of western Oregon under a flood watch today, let’s look at a couple of apps that allow you to monitor your local river levels. The one that I like is FloodWatch. 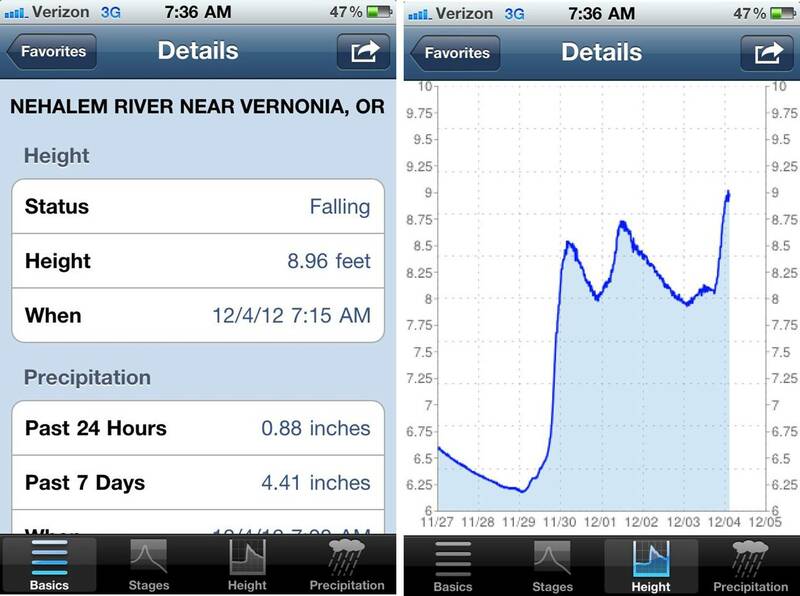 It pulls in real-time data from USGS stream gages, including stream height, rainfall totals, and allows the user to compare to flood stages. Lately I’ve been immersed in the subject of forest management planning. From developing a website that helps landowners navigate the process of creating a forest management plan; to collaborating on a revised set of management planning guidelines for Oregon; to teaching Mentored Management Planning workshops; this has been a major theme of my work over the past year. So I was interested to come across a recent article about management planning in the Oregonian. The article described the management plan that is in place for the city of Forest Grove’s 4,200 acre forested watershed, and the positive impacts that having the plan has had on the land. Though this forest is much bigger than those that most small woodland owners manage, the article demonstrated many of the same principles of forest management planning that I use in my courses. Management planning starts with identifying goals for the site. 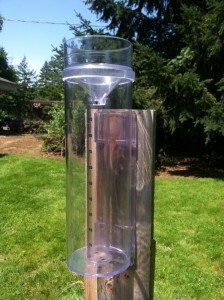 The number one goal in the case of Forest Grove’s watershed is, not surprisingly, protecting drinking water quality. 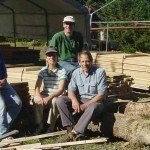 Biodiversity and sustainable timber management are secondary goals. These goals drive all of the actions called for in the plan – such as road rehabilitation, erosion control, and carefully planned timber harvests. Forest management planning has evolved over time. In the 1970’s and ’80’s, most forest management plans were concise timber management plans – laying out succinct timelines for planting, weed control, thinning and clearcut harvest to optimize wood production. Nowadays we take a much more holistic approach. Today’s plans consider all the different resources on a given piece of land – timber, of course; but also recreational resources, streams, fish and wildlife, roads, aesthetics, soils, and much more. 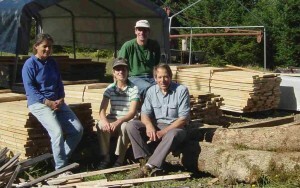 We recognize that most landowners value many other aspects of their property as least as much as the timber resource. Well-constructed plans reflect the suite of values of the landowner and place emphasis on them appropriately. The other important management planning principle that I took note of in the article was the fact that the plan is being updated, ten years after it was originally written. It is a good idea to revisit one’s plan after a time, both to check that the goals are still relevant and to recognize the progress that has been made towards achieving them. 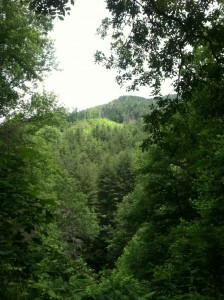 Last week, I traveled to western North Carolina for a natural resources Extension conference. While there, I took a field trip to the Coweeta Hydrological Laboratory – a 5,400 acre experimental forest and the oldest continually running LTER (Long Term Ecological Research) site in the country. 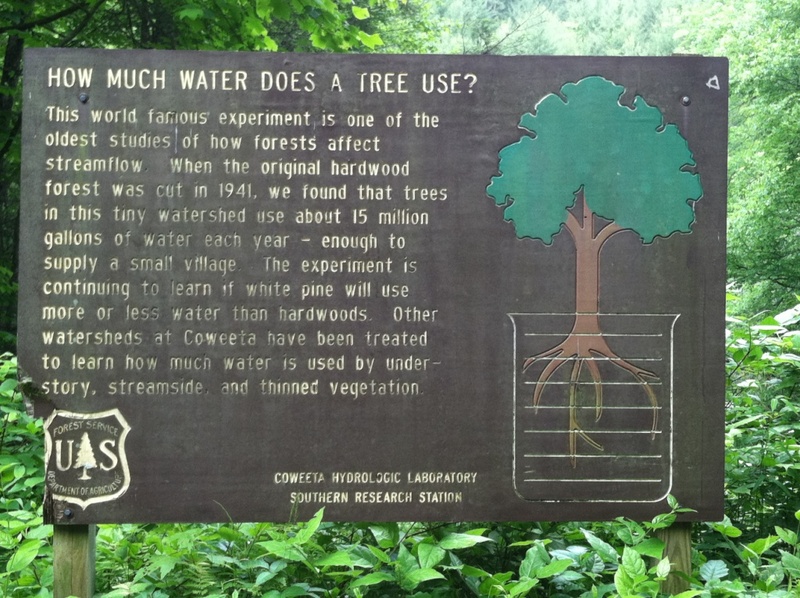 Coweeta is famous as the site of groundbreaking studies of how forest management and land use changes affects things like water supply and quality. It was a fascinating tour and if you have an interest in forest science, read on over the next few days as I share some of what I learned and reflect on how it relates back home in Oregon. Many of the studies at Coweeta are set up as paired watershed studies. Two watersheds of similar size and topography are selected. One is left as a control, and the “treatment” is applied to the other. What is striking about paired watershed studies is the sheer size of the experiments. Here is a photo from a watershed at Coweeta that has been studied since the 1940’s. Back then, scientists wanted to know whether converting a mixed hardwood forest to a pine plantation would impact the water supply. So, they clearcut the treatment watershed, controlled the regrowing vegetation for a decade, and then planted it back to eastern white pine. For the first ten years, there was more water in the stream exiting the cut watershed than in the control watershed. But, as soon as the pine was planted, water levels in the stream began to return to normal, and by the time the pines were ten years old, they were using as much water as the control forest. Ever since then, there has been significantly less water in the stream exiting the pine watershed than the hardwood watershed. Why? 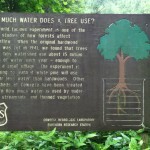 At the risk of oversimplification, it boils down to a few reasons: 1) pines grow (and thus use water) all through the mild Appalachian winter while the hardwoods lose their leaves and shut down; 2) pines have more foliage surface area than hardwoods, so there’s more capacity for photosynthesis (and, when trees photosynthesize they use water); and 3) pines are less efficient water users than the native hardwood species – sort of like a regular shower head compared to a low-flow one – they both get the job done, but one uses a lot more water. These were an important finding because most of the region’s drinking water originates from these mountain streams. We have well-known paired watershed studies in Oregon, too. Some are conducted at our “local” LTER, the H.J. Andrews Experimental Forest. 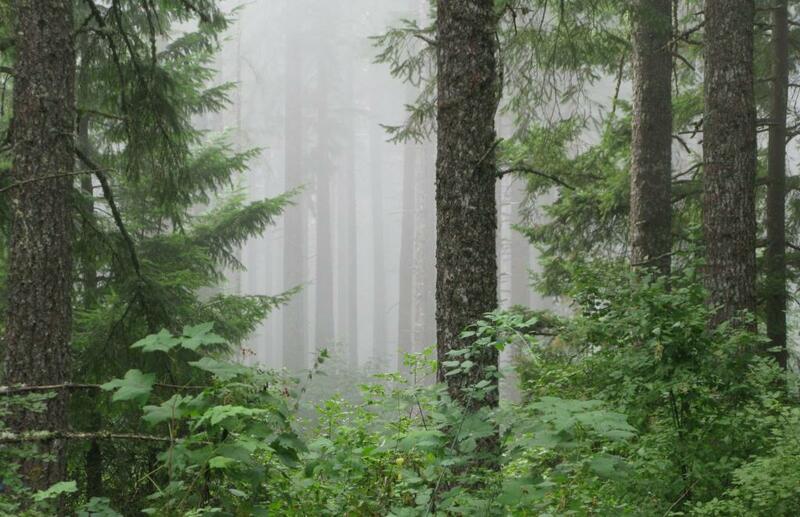 Other paired watershed studies in the Coast Range at Alsea, and Hinkle Creek, and Trask have informed the development of today’s Forest Practices Act and other best forest management practices. 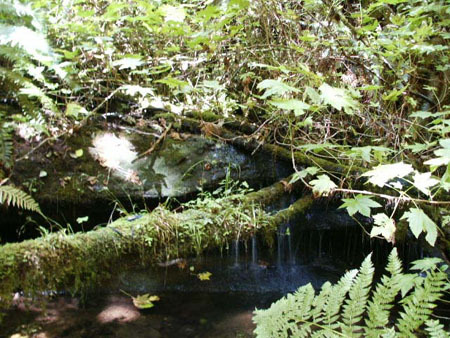 To learn more about the research in paired watersheds in Oregon, you can watch a videostream of a recent lecture at OSU. Also this week, as part of the Starker Lecture Series in the OSU College of Forestry, there was a field tour of the Alsea watershed studies. Unfortunately, I couldn’t make the tour. Did you go? If so, what did you learn? Washington County Small Woodlands Association, Build Local Alliance, and OSU Extension are teaming up for a fun and educational forest tour on Saturday, June 23rd in Timber. 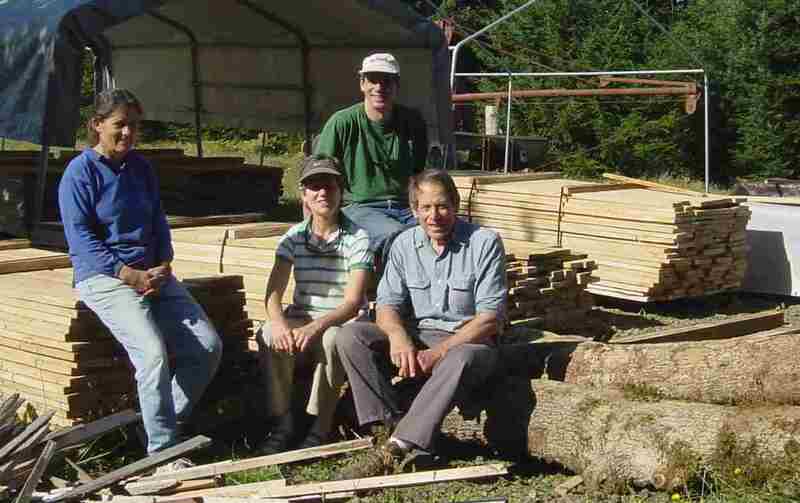 Spend a day in the coast range at Hyla Woods, owned and managed Peter and Pam Hayes, learning about their family’s approach to caring for their forests, maintaining a healthy ecosystem, and producing high quality wood products for local markets. Thanks to support from the abovementioned sponsors and the Oregon Forest Resources Institute, there’s no charge for this event (although a cash donation to cover the food is suggested). However, you must RSVP for the cooks’ and volunteers’ sake. Since parking will be tight, you can catch a bus shuttle to the event from Forest Grove with the OSWA Annual Meeting contingent. Details on that when you RSVP (did I mention you must RSVP?). I have been working with the Hayes family, Washington County Small Woodlands Association leaders, and folks from the Build Local Alliance to plan this event and I am really excited about it. I think it is going to be an outstanding day filled with learning for forest owners, users of wood, or those who are simply interested in learning about their local forests. Download a flyer here. Posted in events, forest management. An updated 24-page guide to help private forestland owners to improve fish habitat in their streams is now available in electronic form on the ODF web site. 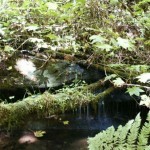 The 2012 edition of the “Private Forest Landowners and the Oregon Plan” guide lists several voluntary measures that forest landowners can take, beyond the basic requirements in the Oregon Forest Practices Act, to accelerate improvements in stream health and promote conditions that can help potentially threatened and endangered fish species thrive. Four categories of recommendations are offered: improvements within a stream, improvements on stream banks, upland improvements to ensure healthy watersheds, and improving forest road or stream crossings. During the first decade of the Oregon Plan, Oregon’s private forest landowners have made $ 84 million in voluntary improvements to build better habitats for threatened and endangered fish species. Additional information about the Oregon Plan for Salmon and Watersheds is available here. As a follow up to an article I included in last winter’s newsletter, here’s a story from OSU’s Terra magazine about some research on the effectiveness of beaver relocation projects. In theory, relocating beavers from areas where they are a nuisance to areas where they could contribute to habitat restoration could benefit all involved (including, presumably, the beavers themselves). Do relocated beavers stay put? Do they actually help create fish habitat in their new homes? Read the blog post, or listen to a short podcast. 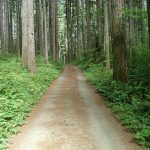 In Vernonia, there’s the Columbia County Small Woodlands Association/OSU Extension Service Summer Woodland Tour & Lunch at the Keasey Tree Farm. Highlights include walking tour and discussion of streamside & upland management, a small scale equipment demo, historic logging exhibit, and a BBQ lunch. Tour begins at 9:00 am. To RSVP, call Bill or Lydia at (503) 556-2014. 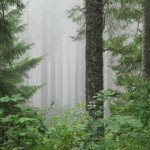 In Forest Grove, there’s the Washington County Small Woodlands Association summer tour at the Howell Tree Farm, 9 am – 3 pm. Activities include portable sawmill, firewood processing & pruning demonstrations, stream restoration, walking tour, and a free BBQ lunch courtesy of the Tualatin Soil & Water Conservation District, OSWA and the Oregon Forest Resources Institute. 51075 NW Cox Rd, Forest Grove. For details, contact WCSWA. Further south, in Lafayette is an event from 2-6 pm sponsored by the Build Local Alliance at the Trappist Abbey. Tour topics will include silviculture, invasive species, FSC wood products and markets, and working forest conservation easements. RSVP to info@buildlocalalliance.org.